The “Black Virgin”, Nui Bah Dinh mountain, with a storm on the way that will water everything. 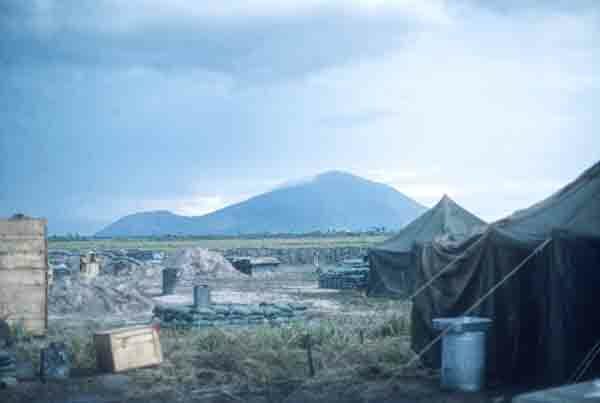 North and West of the mountain were the French named “War Zone C & War Zone D”; areas of triple canopy jungle. These areas in Vietnam connected to Cambodia and were used as home base to many North Vietnamese Army outfits. They were often hit with B-52 bomb strikes. The ground shaking power of a B-52 bomb run is difficult to imagine, but a person standing 1 mile away would would be thrown to the ground. The sound was the devils drum at full volume.